Akron Triviators: And now, a word for a sponsor. . .
And now, a word for a sponsor. . .
You may have noticed the Amazon Affiliate links on the blog. For a long time, it's been just a referral link to the jokebook I published for kindle. I finally updated it, and added several more items, and two new categories. It's literally a list of songs that I have played during trivia nights. Not every song is on there, but a ton of them are. I'm also going to update it (ideally BEFORE trivia) with songs I'll be using in my playlist for the next show. Think of it as a bonus clue for being an obsessive geek. 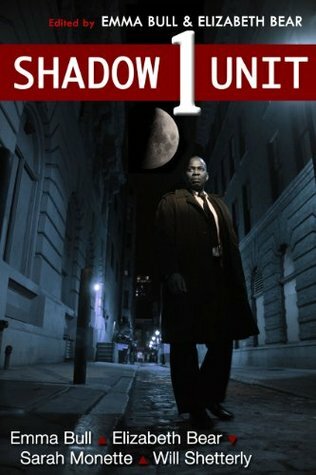 In (creator) Emma Bull's own words, Shadow Unit is fan fiction for a tv series that never existed. Bull thought up this fantastic urban fantasy type tv series, taking ideas from her old favourites such as x-files and The Man from UNCLE, and then brought on board some of her writer friends to collaborate and write for it. The series revolves around a small branch of the FBI, the 'Anomalous Crimes Task Force' also commonly called 'the shadow unit', whose job it is to identify and track down Gammas - humans infected an unknown entity (simply called the 'anomaly'). No one knows what the anomaly is, whether parasite, virus, bacteria etc, but it's effect on humans is to give them supernatural abilities, and then to bend their mind subtly to it's own purpose. Most Gammas end up using their abilities to harm or kill, and that's when the shadow unit gets called in. The format of the book is as a collection of short stories, called episodes, each written by a different author, but all set within the same universe and timeline. The first episode Breathe makes a very good introduction to the series. As it brings in the character Daphne Worth who has just joined the Shadow Unit team, and is as new to all this as we - the readers - are. Worth was originaly an EMT , who trained up to join the team after a nasty encounter with a Gamma that resulted in the death of her colleagues. After meeting the team, Daphne gets to go on her first case. Several victims have been found suffocated to death without any apparent external cause. The Gamma that did it is still out there, and the team are racing against the clock to put all the evidence together and catch the Gamma before the Gamma takes its next victim. There are 13 collections availible for Kindle so far. The first episode is FREE. You can get it here. You can also read much of it online for free at their homebase at shadowunit.org. I'll make a few cents on any sales from a click-through, but I am really showcasing Shadow Unit here because I think you'll enjoy them. Check it out!